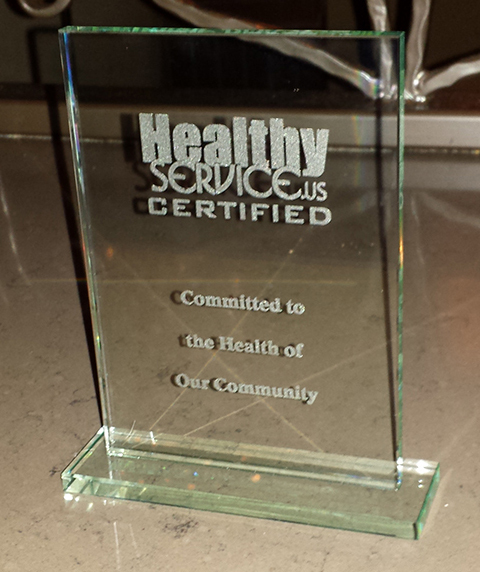 Healthy Service Certification can make a huge difference in the dining experience. Read about the Science behind Healthy Service here! Health Department Standards make sure your food is safe during preparation. Healthy Service makes sure it is served to you in the safest possible manner. Most restaurants are very clean and put a great deal of effort into their customer's well being. Long days and changing management can sometimes allow common sense standards fall by the wayside. There are many areas for improvement in every restaurant. For one example, the next time you are dining, look to see if the person bussing the table also serves food. One would hope they would wash their hands in between the two, but the reality is it very rarely happens. Healthy service gives restaurants not only the standards to abide by, but the tools to integrate higher standards into their busy and hectic work days. Through Healthy Service education, policies and tools we can help managers and staff utilize sanitary techniques in a way that easily fits into their current routines. This not only help to keep the staff healthier, but reduces transmission between staff and customers. A policy is only as good as the ability to implement it. 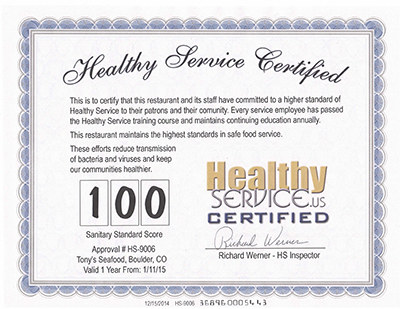 Healthy Service uses state of the art online training and certification to be sure the latest sanitary serving techniques are available to Healthy Service Certified Restaurants. Our Service Coaches have extensive experience in all aspects of dining, from breakfast diners to fine dining. We know what works and how to convey that information to servers, but more importantly, how to gain their support and cooperation. Physical inspections and consumer feedback insure compliance. 1) All bussers, servers, kitchen and management staff must take and pass the Healthy Service Training Course annually. Certificates of completion must be kept on premises for inspection. 2) All dining surfaces should be sanitized between customers. This includes menus, chairs, tables, salt and pepper and condiment bottles. While time consuming in the past, the Healthy Service products and process makes this quick and easy for the server or bus staff. 3) Staff must comply with cough, sneeze and touch procedures, and hand sanitizing and washing standards at all times on restaurant premises. 4) Restaurant must comply with the Healthy Service Sick Employee Guidelines. Our Healthy Service Management Handbook provides advice, tools and policies to make this a simple and easily implemented reality. 5) It is strongly preferred that restaurants have a dedicated busser to clear tables, that will not deliver food to tables. Exceptions - Smaller restaurants and some service models do not allow for a separate busser. In this case the restaurant must follow our busser/server training standards to be sure that the proper sanitary measures take place between bussing and serving. 6) It is STRONGLY recommended that Hand Sanitizer must be made available to diners table side and it is required that it is available to staff at wait stations. By allowing customers access to hand sanitizer the transmission of colds and disease can be greatly reduced. Hand sanitizer is an ideal product as it offers a quick and easy sanitary solution for both consumers and staff. Easier said than done? This is the first thing many in an average restaurant will say. While true, our implementation techniques make these standards not only possible, but readily adopted. These measures are not only good for consumers, but with Healthy Service standards, employees get sick less often, miss less work days and have a better work environment. Plus they will bring less colds and flus home to their families which everyone can appreciate. We do not know what the future holds in terms of communicable diseases. We do know that we must adopt higher standards NOW rather than later.